What do we need to bring to Bay Haven? – Bay haven is a “turn key” rental which means that it is completely furnished including bedding, towels, dishes, pots and pans, silverware, everything you will need to live comfortably. Personal items such as toothbrush, shaver, clothing, etc. are not included so please bring them with you. Also not included are food and beverages but these may be purchased at stores on Anna Maria. How does Bay Haven differ from beach hotel rentals? – Bay Haven is a home that has been converted to a vacation rental. Unlike a beach hotel, there is no daily maid service. It is a home away from home. The advantage is that you will have complete privacy but, of course, you will have to make your own bed (only if you want to) and you’ll have to do the dishes and other typical household chores. When you depart you are expected to leave the rental in the same condition you found it except as outlined in the check-out procedure. A final cleaning service is available for an extra fee. Why isn't cleaning upon departure included in the rent? - At one time we did include cleaning with the rent but when guests started asking if they could save the cleaning fee by doing the cleaning themselves, we decided to make it an option. Cleaning may be arranged for $80 - $100 depending on the cleaning service contracted. We will be flying in. What airport should we use? - Most guests use either Tampa International Airport (TPA) or Sarasota-Bradenton International Airport (SRQ). TPA is 55 miles (1 hour and 15 minutes) from Bay Haven while SRQ is 21 miles (40 minutes) away. St. Petersburg-Clearwater International airport (PIE) has recently become more popular since Allegiant Air began discount flights there. PIE is 47 miles (1 hour) away from Bay Haven. Is Bay Haven on the beach? – Bay Haven is directly on Bimini Bay but not on the beach. All beaches on Anna Maria Island are open to the public. The closest beach is about 200 yards from the rental and is on Tampa Bay. The closest beach with facilities, restrooms, picnic tables, playground, etc. is at Bay Front Park which is located seven-tenths of a mile away between Anna Maria City Pier and the Rod and Reel Pier. The big public beaches with facilities and lifeguards on the island are Manatee Beach and Coquina Beach. Maps are available at Bay Haven. The whole seven-mile western shore of Anna Maria Island is a wide sugar sand beach and is open to the public. Access paths are located every hundred yards or so along parallel streets. Please follow community parking regulations. There are five public beaches with facilities on the island. May I bring my boat? – Yes, maybe. There is a 60 foot dock at Bay Haven that can accommodate two boats in the 20’- 25' range. Please request permission from us before bringing your boat. The water in Bimini Bay is deep and there are no bridges between the dock and Tampa Bay and the Gulf of Mexico. The closest launch ramp is about one mile south of Bay Haven. Boater information including a map and directions are available upon request. May I bring my kayak? – Yes, the area is perfect for kayaking and you can launch directly from the dock or seawall. Kayaks may also be rented locally. Should we bring our bicycles? 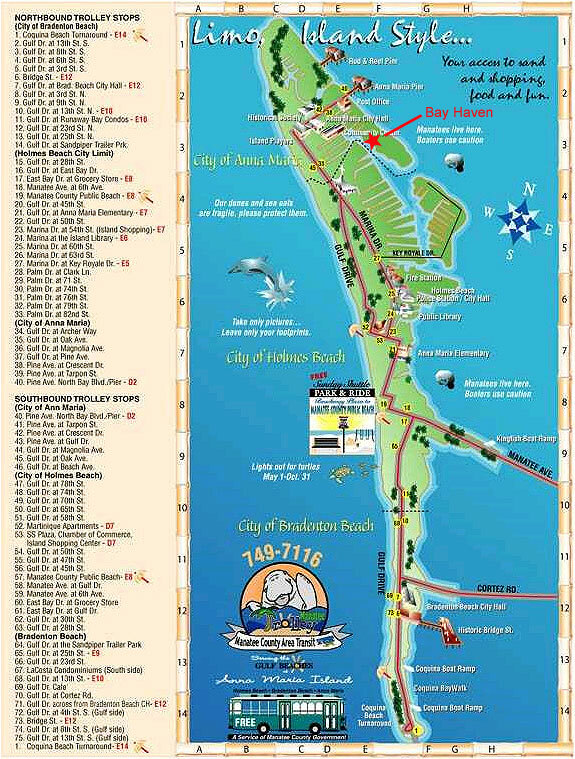 – Anna Maria Island is a wonderful place to cycle. Bring your own or rent one locally. How likely are we to see dolphins or manatees? – Very likely but we can’t give you a guarantee. Some days we see both and some days we don’t see any. The probability that you will see one or both during a one week stay is about 90%. Is it still possible to find shells and sand dollars along the beaches? – Absolutely. The beaches on the north end of Anna Maria Island are an excellent place to go shell hunting. What’s the Island Trolley? – The Island Trolley is a free shuttle service that runs the length of the island departing every 20 minutes or so depending on the time of day. The closest stop to Bay Haven is at the Anna Maria City Pier. Are there any restaurants on the island? - Yes, there are quite a few restaurants on AMI. You will be pleasantly surprised by the variety, reasonable prices, and food quality. We have a comprehensive listing in the information booklet you will find when you arrive. How is the fishing? – Fantastic!!! The fishing off the dock is outstanding. Fishing in Tampa Bay or in the Gulf can’t be beat. Numerous fishing charters are available on the island. Check this web site: http://marinefisheries.org/license.htm to see if you need a license. Licenses may be purchased at: http://myfwc.com/license.html or at many places where fishing gear is sold. How is the bird watching ? – Outstanding!!! Since Bay Haven is located within a bird sanctuary there is a large variety of birds to observe including herons, egrets, pelicans, sand pipers, laughing gulls, parrots, and many more. Robinson preserve in NW Bradenton is home for more that 100 species of birds. From Bay Haven to the main entrance of the preserve is about 11 miles. What else is there to do in the area? – There are numerous water sports available on the island including parasailing, windsurfing, jet skiing, sailing and water skiing. Bradenton and Sarasota are a mecca of cultural activity including the De Soto National Memorial, Robinson Preserve, Asolo Theater, Van Wezel Performing Arts Hall, Mote Aquarium, South Florida Museum, Egmont Key, and more. There are also numerous museums, golf courses, and shopping areas within a short drive. Tampa is only an hour away and Orlando is two hours away. See the visitors section of the Manatee County website for more information. What is the weather going to be like when I am there? - The weather on Anna Maria Island is very moderate. It is cooler in the summer than mainland Florida and warmer in the winter. Check the weather chart to see average temperatures and precipitation for each month. Will my cell phone work at Bay Haven? - Yes, Bay Haven is within the cell phone reception area. There are, however, areas of Anna Maria where you may not be able to use your cell phone because the cell towers are too far away but you should get at least two bars of reception at Bay Haven. We have received no reports from our tenants that their cell phone would not work at Bay Haven but that is no guarantee since there are numerous cell phone providers. You may want to check with your particular provider. There is a land line phone at Bay Haven for your use. Why should I stay at Bay Haven when I could stay at a beach hotel or condo directly on the beach? - We are glad you asked. A lot depends on what you want and how much you want to pay. If you want a short walk to the beach and you want to spend most of your time on the beach, you will probably prefer the beach hotel or condo but you will also pay a lot more for less. Bay Haven is very private. You won't see other tourists as you sun yourself by the bay or on the sixty foot dock. You will see dolphins, manatees, and numerous tropical birds as well as fantastic sunsets. You'll have a two bedroom two bath house with complete accommodations including a full kitchen, full size washer and dryer, computer with Internet and WiFi, cable TV and HD LCD TV and much more. And...if you want to go to the beach you can walk down the street or drive a short way to the public beaches along the Gulf. You can sip your coffee on the lanai as the sun rises and have a sundowner on the dock and at only a fraction of the cost of a motel or condo. If you aren't convinced yet, please read what others have said about Bay Haven. How much will it cost to take a taxi from Tampa Airport to pick up a rental car off site? - That is a very good question since rental cars are often less expensive off site, especially during peak times. Taxi cab service is provided from the Commercial Ground Transportation Quadrants located in all four corners of the Baggage Claim Level. The airport is served by Yellow Cab, (813) 253-0121, and United Cab, (813) 253-2424. Both companies charge the same fares: $2 plus $2.25 per mile. The minimum fee from the airport is $15. Once the meter exceeds the $15, the minimum no longer applies. There is a maximum flat rate fee of $25 to Downtown Tampa and the cruise port. How private is Bay Haven? - Bay haven is located on a cul-de-sac at the end of South Drive which is off South Bay Blvd., a "No Outlet" street. The side opposite the street is directly on Bimini Bay so a boat may ocassionaly pass by. Also, Bay Haven is the "A" side of a duplex. The "B" side is an annual rental occupied by a single female school teacher who is not there during the school day. She is very quiet and most tenants have reported that they didn't even know anyone lived there. So, Bay Haven is about the most private rental on Anna Maria Island. Free Trolley - There is a free Trolley that runs the length of Anna Maria Island. It runs every 30 minutes and there are many designated stops along the island. If you want to pick up a trolley anywhere along the route, look out for the trolley benches which are painted green and have "Trolley" written on them. Sit on the bench and wait until the trolley arrives. Be sure you are on a trolley bench as there are several miscellaneous benches along the route. The closest Trolley stop to Bay Haven is at the end of the city pier which is about a half mile away. See the map for a list of Trolley stops. Clicking on the map should bring up a larger image.